திருவரங்கம் பெரிய கோவிலும் - சயனித்து இருக்கும் பெரிய பெருமாள் ஆன அரங்கநாதனும் நமக்கு எல்லா நலன்களையும் தர வல்லர்கள். கங்கையினும் கூட புனிதமாக கருதப்படுவது 'காவிரி' ஆறு; இந்த நதி - காவிரி, கொள்ளிடம் என்று இரண்டாகப் பிரிகிறது; கொள்ளிடம் வைணவ மரபில் ’வட திருக்காவேரி’ என்று பெயர் பெறுகிறது. இந்த இடைக்குறையின் நடுவே உள்ள அற்புதமான இடமே - "திருவரங்கம்”. ’வண்டினமுரலும் சோலை, மயிலினமாலும் சோலை’ என்றபடி இயற்கை எழில் மலிந்து தோன்றும் இத்தீவின் நடுவில் திருப்பொலிய நிற்பதுதான் ‘அணியினார் செம்பொனாய அருவரை அனைய கோயில்’ என்னும் நம் பெருமாள் இனிதுறையும் ‘பெரிய கோயில்’.............. இத்திருக்கோவிலில் பெருமாளுக்கு கைங்கர்யம் செய்து வருகின்ற யானையின் பெயர் 'ஆண்டாள்" ... மேலும் ..
For Sri Vaishnavaites, Srirangam venerated as “Kovil” is the most reverred temple. The history of the Srirangam temple is closely related to the development of the Srivaishnavism itself. The sthala purana of Thiruvarangam, the Sriranga Mahatmiyam traces the evolution of this temple from its inception as the Ranga Vimana, worshipped by Brahma in Satyaloka to its descent to the banks of the Cauveri. Srirangam, the abode of the Supreme Lord, Sri Ranganatha, the reclining form of Lord Vishnu, is surrounded by the reverred river Cauvery- which branches of to Kollidam and forms an island surrounded by Kaveri and Kollidam. The entire complex is full of architectural marvel. It draws a lot of devotees from all parts of the world. The ‘Rajagopuram’ is 236 feet high with 13 tiers and is the tallest temple tower in Asia. ~ and in the perfect temple town – one for sure would not miss the calm friendly temple elephant named ‘Andal’. It is part of Srirangam legend.. I had earlier posted of our love for the majestic tusker named “Azhwar” at Thiruvallikkeni, which never misbehaved. The giant tusker would be bathed, decorated with thiruman on its forehead and would accompany perumal purappadu. At the end of the purappadu have seen Azhwar offering ‘saamaram’ to Perumal and would walk backwards. It used to carry sacred water (Thirumanjana kudam) from the temple tank, being taken in a procession every morning. The elephant rejuvenation camp conducted by TN Govt has been a great hit – the elephants of various temples, Mutts and various other places are provided rest, medical treatment and happiness in the forest environ for 48 days. Reports suggest the otherwise tame and friendly, Andal, the 35-year-old elephant of Thiruvarangam is reportedly refusing to mingle with other elephants at the rejuvenation camp at Thekkampatti ; the reason : its mahout of many years was relieved from duty midway through the camp. According to the official sources, S. Sridharan (57) had taken care of Andal from October 16, 1986, the day it came to the Srirangam temple. The elephant had not had any other mahouts. The elephant and its mahout had developed such a special bond… Sridharan reportedly was a bachelor and would be seen by the side of the elephant all the time, so fondly taking care of the pachyderm. Sridharan had developed differences of opinion with the temple management and had given resignation letters thrice – In Oct 2012; Oct 2012, Apr 2013 and again on December 13, 2013, right before the rejuvenation camp began. The Hindu reports that the temple officials pacified him and requested him take the elephant to the camp along with an assistant mahout on the assurance that everything would be sorted out after the camp concluded. 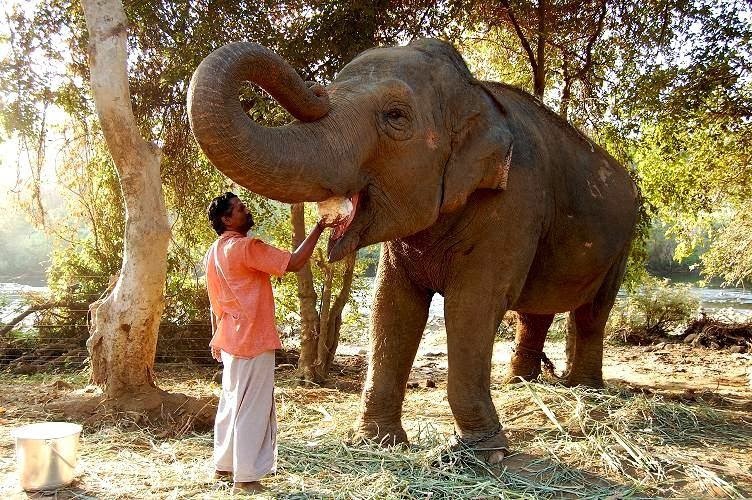 As it happens with Govt Departments - even as the camp was under way, Sridharan was informed through a letter that his resignation letter had been accepted and was asked to handover the elephant to the assistant mahout. His requests seeking time till the conclusion of the 48-day camp was not accepted, according to official sources. Following this, Sridharan left the camp and since then, it was reported that the elephant was not behaving properly. According to newspaper reports - the officials of Hindu Religious and Charitable Endowments Department, which is running the camp, refuted all the reports. They still conceded that the elephant was yet to get used to the new mahout. As such, the mahout was yet to take the elephant for bathing or daily walk. That is the official way of handling things….. ‘it is not people; it is not animals – it is all about files and procedures’ – management by instructions and things will run ‘men may come and men may be instructed to go’……. PS : the fans of Andal would be too pained to read anything on the distraught condition of it… however, a photo in Srirangam today shows the new mahout Rajesh offering food to Andal. the photo above courtesy : Srirangam today.